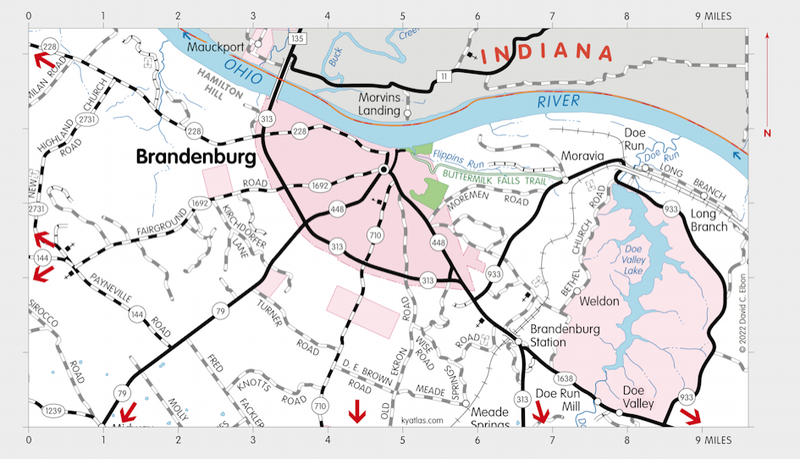 Brandenburg, the seat of Meade county since 1825, is located on the Ohio River. It was established in the early nineteenth century around the tavern and ferry of Solomon Brandenburg. The area had earlier been known as Falling Spring and Buzzard Roost before becoming known as Brandenburg's Landing. Brandenburg was incorporated in 1872. The Brandenburgh Court House post office opened in 1826. It was sometimes spelled Brandenberg, but the official spelling is now Brandenburg. The population in 2010 was 2,643. The original county seat was nearby at Claysville.